I finally did it! 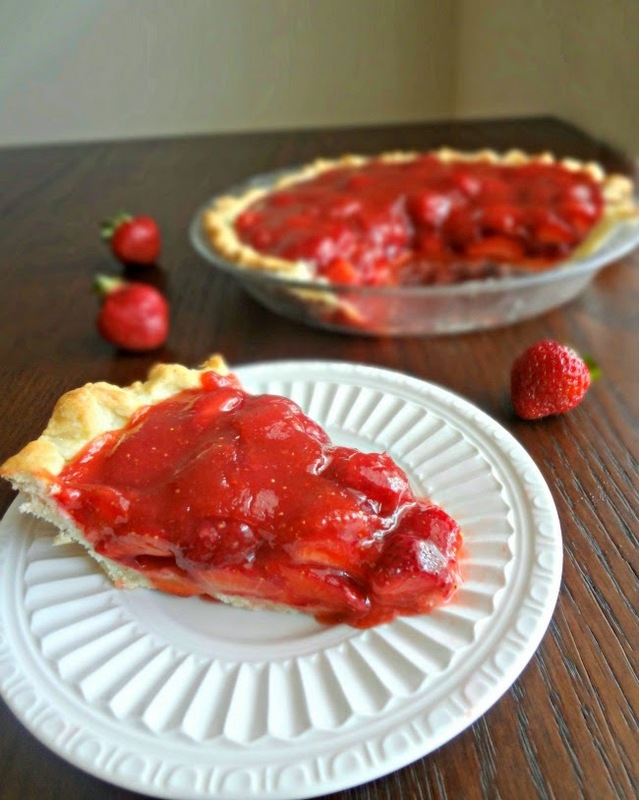 I was a good fiance' and made my Michael a strawberry pie. Michael loves pie. Like...looooves it. It might have something to do with the fact that, when he lived at home, if he was feeling down his mom would make him a pie. Actually...from what I understand...she just makes a lot of pie in general. Anyway, Michael also looooves strawberries. Like-if he sees a strawberry item on a menu he gets crazy excited. So, I dedicate #StrawberryWeek to Michael! Due to my fiddling with this recipe and using some honey in place of the sugar, and just in general it not being his mom's pie, I was a liiittle nervous watching Michael eat it. Hoping, praying he would like it. He took a bite, made a sound of "mmm. ", nodded his head, and said "It's really good". HOOOORAYYY! I felt like I was in that commercial, "Hey Mikey-he likes it!" I can really appreciate how pretty this pie is. Aesthetically speaking...I LOVE it. Red is my favorite color and I love the vibrancy the strawberries give to it! Michael always complains that all the foods I like are shades of brown. He's not wrong. My foods aren't pretty like his! 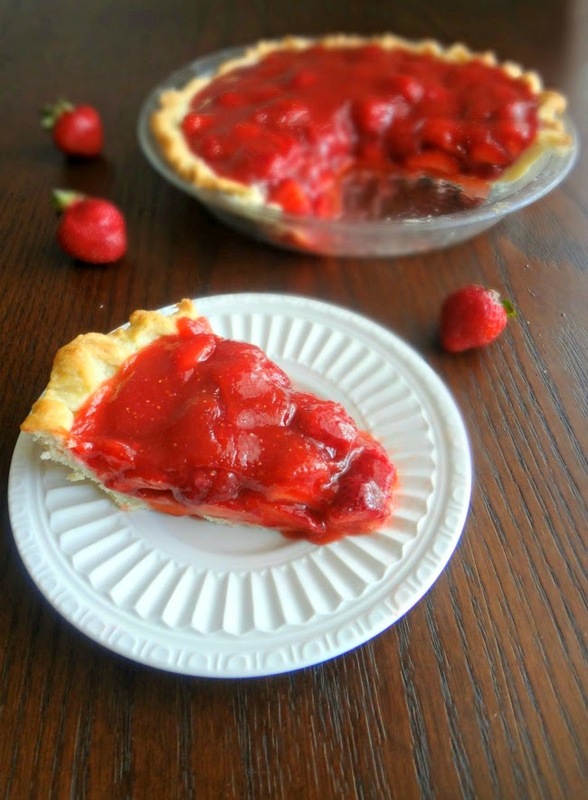 Most strawberry pies that I've experienced are made with Jell-O. Which I am not knocking. But I just adore the simplicity of this recipe. It's just a few real, pure ingredients coming together and creating a lovely, classic, rustic pie that I feel like my great-grandma could have made. Sometimes the old fashioned way is the best :) And it honestly takes, like, no extra effort! You make crust, you bake crust. 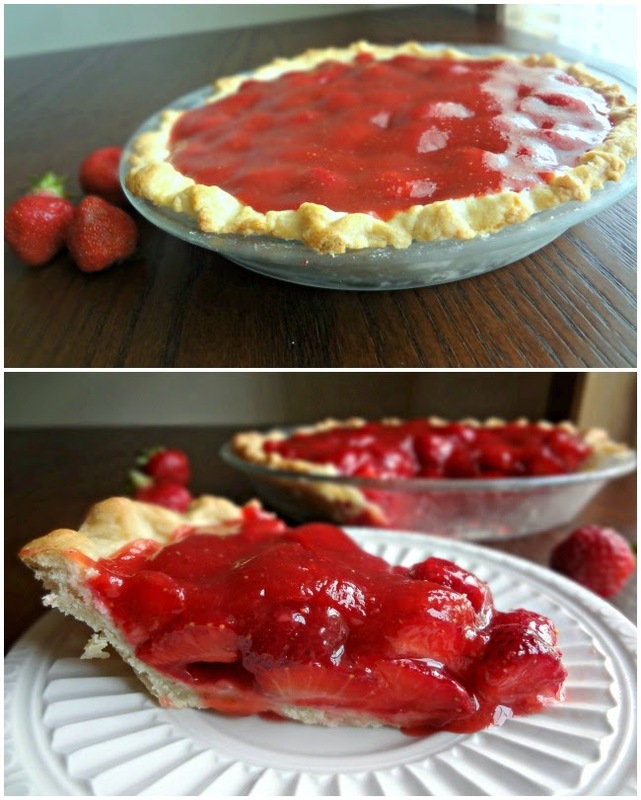 You slice strawberries and put them in the crust. And you make a quick and easy strawberry sauce, pour that over, chill it and-DONE! Fresh, refreshing, comforting, fruity, wonderful. Strawberry season being used to its full potential. To blind bake the crust: grease a 9 in. pie plate with butter and flour and lay in your prepared pie crust dough. Do to the edges as you wish. (I tried and failed to crimp them, as per usual). Preheat oven to 425F degrees. Lay a piece of parchment paper inside the pie crust. Pour in uncooked beans or rice to act as pie weights (or if you have specific pie weights, use those). Bake 15-18 minutes, until the edges begin to brown. Lower heat to 375F degrees and remove the weights and parchment paper. Use a pastry brush to lightly brush an egg-wash (I used milk but you can also use a mixture of 1 egg + 1 tbsp. water) over the entirety of the partially baked crust. Bake and additional 5 minutes, until slightly golden. Let cool. Wash and dry the strawberries, removing the stems/hulls. Take 1 and 1/2 cups of strawberries and puree in a food processor/blender-you should have 1 cup strawberry puree. 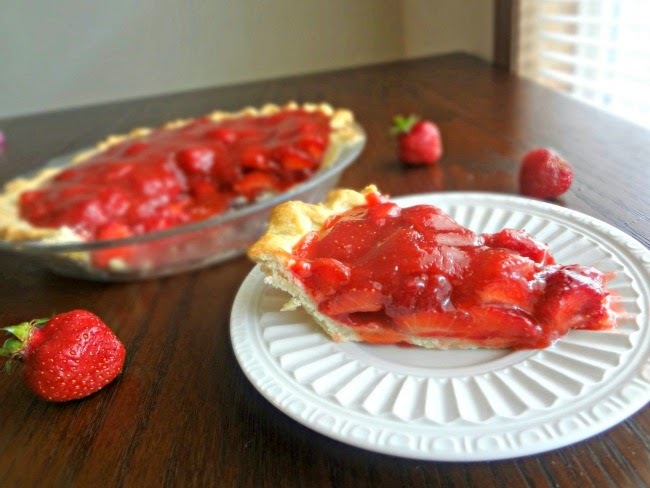 In a medium saucepan combine the strawberry puree, sugar, honey, cornstarch, and water. Whisk together and cook over medium heat until it comes to a boil. Boil 1 minute and then remove from heat. Add in vanilla and slowly whisk as it thickens. Let cool for 5 minutes, stirring occasionally to keep from sticking. 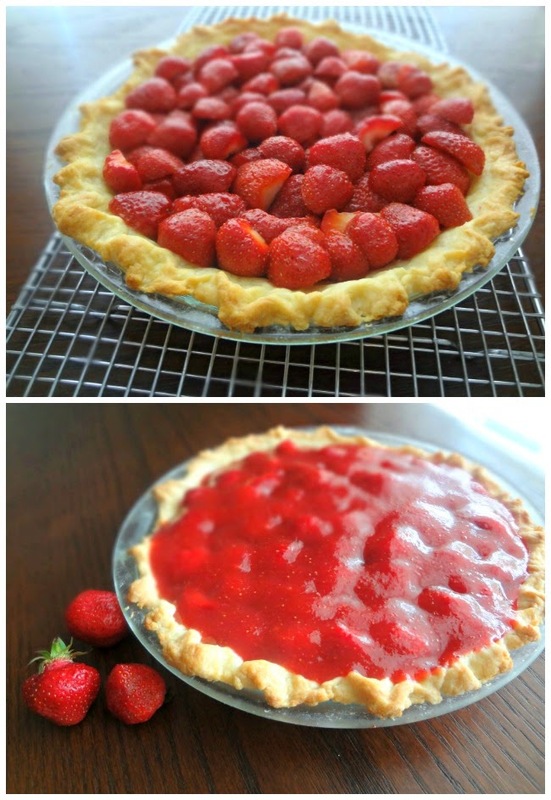 Meanwhile, slice strawberries in half (or thirds if the berries are particularly large) and arrange them into the pie crust until it is filled. Pour slightly cooled sauce over the sliced berries, trying to cover as evenly as you can. Refrigerate for at least 2 hours, or until ready to serve (and refrigerate any leftovers)-pie is best when eaten the day it is sliced.